October 18, 2011 - Airbus has completed installation of the first Rolls-Royce Trent XWB flight-test engine on the A380 “flying-testbed” aircraft (MSN 001). The aircraft is depicted here at Airbus’ Jean-Luc Lagardère site in Toulouse where the engine was mounted. The aircraft and engine will now be prepared for the flight-test campaign commencing in the coming weeks. The Trent XWB engine, which is the largest Rolls-Royce turbofan with a 118-inch diameter fan, has been specially designed to power all members of the new Airbus A350 XWB Family with maximum efficiency. By 2004, Airbus was facing pressure from customers to develop a competitor for the Boeing 787 Dreamliner, and in October 2005 formally launched the new aircraft designated A350, which was to be essentially an updated A330. 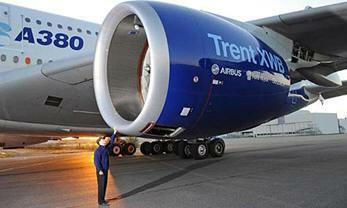 Rolls-Royce offered a variant of the Trent 1000, dubbed Trent 1700 which would have been similar to the Trent 1000, but with a throttle-push to 75,000 lbf (330 kN) static thrust. Unlike the Trent 1000, the Trent 1700 would have been a conventional bleed-air engine, and would be developed in partnership with Kawasaki Heavy Industries. After a lukewarm response from the airlines, Airbus reviewed their A350 proposal, and in July 2006 announced that they would be offering instead an all-new aircraft, the A350 XWB (Xtra Wide-Body), with a fuselage diameter slightly greater than that of Boeing's 787, to compete with both the 787 and the 777. Rolls-Royce had reached an agreement with Airbus to supply a new variant, currently called the Trent XWB, for all versions of the Airbus A350 XWB. Originally announced with a static thrust range of 75,000–95,000 lbf (330–420 kN), by September 2007 Airbus had revised their requirements down to 75,000–93,000 lbf (330–410 kN). Certification is planned for 2011, with the 84,000 lbf (370 kN) Trent XWB-83's entry into service on the A350 XWB-900 expected in 2013. This will be followed by the 75,000 lbf (330 kN) Trent XWB-74 in 2014 on the A350 XWB-800, and finally the 93,000 lbf (410 kN) Trent XWB-92 on the A350 XWB-1000 in 2017. The engines for the largest A350 has been uprated to 97,000lbf to meet new performance requirements to better compete with the Boeing 777-300ER. General Electric has yet to confirm that it will offer a GEnx variant for the A350 XWB. Flight International magazine has suggested that the GE/Pratt and Whitney Engine Alliance GP7000 may be the second engine option for the aircraft, at least on the smaller variants. In June 2007, Rolls-Royce announced that it had signed its biggest ever contract with Qatar Airways for the Trent XWB to power 80 A350 XWBs on order from Airbus worth US$5.6 billion at list prices. In November 2007, another large contract was announced at the Dubai Airshow from Emirates Airline for Trent XWBs to power 50 A350-900 and 20 A350-1000 aircraft with 50 option rights. Due to be delivered from 2014, the order is potentially worth up to $8.4 billion dollars at list prices, including options. By the end of February 2009, Rolls-Royce had secured orders for engines to power a total of 420 A350 aircraft. By November this figure was up to 500 aircraft. The first engine test was made in June 2010 in an engine testbed.